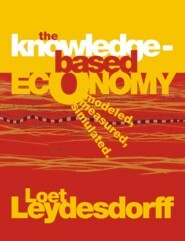 "Challenging, theoretically rich yet anchored in detailed empirical analysis, Loet Leydesdorff's exploration of the dynamics of the knowledge-economy is a major contribution to the field. Drawing on his expertise in science and technology studies, systems theory, and his internationally respected work on 'the triple helix of university-industry-government relations', the book provides a radically new modelling and simulation of knowledge systems, capturing the articulation of structure, communication, and agency therein. This work will be of immense interest to both theorists of the knowledge-economy and practitioners in science policy." "This book is a ground-breaking collection of theory and techniques to help understand the internal dynamics of the modern knowledge-based economy, including issues such as stability, anticipation, and interactions amongst components. The combination of theory, measurement, and modelling gives the necessary power with which to address the complexity of modern networked social systems. Each on its own would partly illuminate an innovation system, but the combination sheds a far brighter light." "The sociologist Niklas Luhmann is considered one of the few social scientists possibly able to explain a decisive event once it has happened. In this book, Loet Leydesdorff answers the challenge to take Luhmann's analysis one step further by introducing anticipation into the theory. This book provides a fascinating exploration of the use of recursion and incursion to model social processes." Loet Leydesdorff (Ph.D. Sociology, M.A. Philosophy, and M.Sc. Biochemistry) is Senior Lecturer at the Amsterdam School of Communications Research (ASCoR), University of Amsterdam. He has published extensively in science and technology studies about the Triple Helix of university-industry-government relations, scientometrics, systems theory, social network analysis, and the sociology of innovation. He received the Derek de Solla Price Award for Scientometrics and Informetrics in 2003. In 2005, he held The City of Lausanne Honor Chair at the School of Economics, Universite de Lausanne, Switzerland. A Sociological Theory of Communications: The Self-Organization of the Knowledge-Based Society(Universal Publishers, 2001).